Micro .004 Hex - 1lb. - New Size Extra Small - .008 Hex - 2oz. Extra Small .008 Hex - 1/2lb. Extra Small .008 Hex - 1lb. Small .015 Hex - 2oz. Jar - Sold By Weight Small .015 Hex - 1/2lb. Small .015 Hex - 1lb. Large .035 x .035 Square - 2oz. Jar -Sold By Weight Large .035 x .035 Square - 1/2lb. 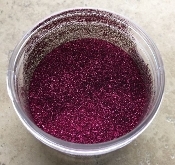 .015 Hex Cut Polyester Glitter available in 29 colors. Large .035 x .035 Square - 1lb. Jumbo .062 x .062 Square - 2oz. Jar -Sold By Weight Jumbo .062 Square - 1/2lb. Extra Large .125 Hex- 1/2lb. Whiskers .0125 x .125 - 2oz. Jar - Sold By Weight Whiskers .0125 x .125 - 1/2lb.